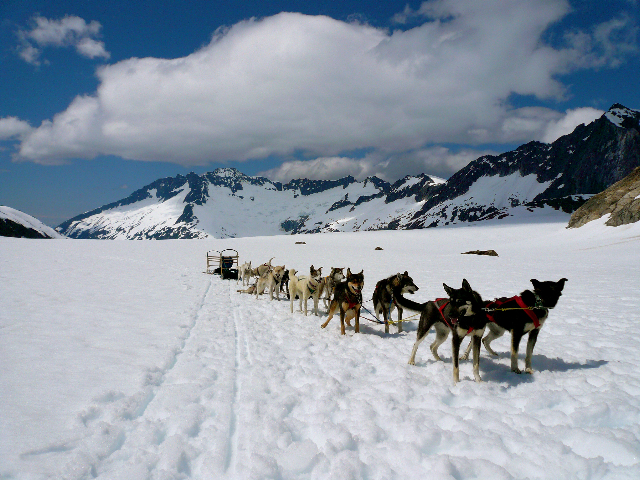 Can you imagine yourself standing on the runners of a dog sled with a team of huskies loping across the ancient snowfields, nestled among the peaks of the vast Juneau Icefield? Then follow the lure of the trail to this once in a lifetime experience in Juneau! You will be conveniently picked up at the main cruise ship terminal and transported to the heliport where you will start this very special adventure. The helicopter flight is only the beginning of this legendary experience that includes flying over the Icefield to the dog camp, a kennel tour, and the dogsled ride! When you take off, glaciers are seemingly within arm's reach. Glacier-carved mountains will unfold in front of your eyes as you embark on your flight to the camp. Upon arrival at your destination, you will share this adventure with 80 Alaskan huskies and hear unique personal accounts of the Iditarod, back country experiences and have an opportunity to ask questions. Feel the excitement as the team is hooked up, and….you're off! The thrill of driving a dog team and participating in a great Alaskan pastime creates this ultimate experience! Our extended version includes an extra landing! On your return leg, we can land your party at a lower level of the glacier to see some beautiful features of glacial movement that are really highlighted at the more advanced edge of the glacier. Please indicate the weight of each participant in the comment section of the order form. For those guests weighing more than 280 lbs or more you will need to book as the "280lbs+ Adult" ticket. This tour is weather dependent, generally shutting down for the season anywhere from early to mid-September. If the Dog Sled operation is shut down due to snow levels, we will convert you to the Above and Beyond Helicopter Tour. The weight restriction is 280 pounds (clothed weight, including cameras, shoes, coat, etc.). Passengers 280 pounds or more should book as the "280lbs+ Adult" ticket.